Our family was blessed with a new member this year, and I want to jot these impressions down before my brain completely turns in its two week notice. I'm struggling to keep up with all the myriad details of family life, from silly things to when Red Ribbon week is, to cancelled appointments and which kind of soup I meant to order from Chinese takeout (Alex just buys me both kinds now because he is a smart man and values harmony). We had a baby. She is beautiful. I cannot credit how I in the world I am fortunate enough to have each of my children and to have these stories to share. 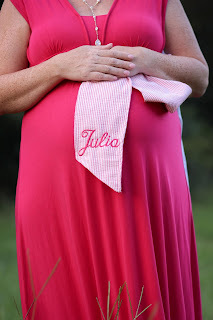 After passing my due date with Julia, all my midwife had to do was gently remind me that going past 40 weeks might not be wise as someone of advanced maternal age and we scheduled an induction then and there for the next morning. Throughout Julia's birth, Holly worked with me as a teammate to achieve a safe and peaceful birth for Julia. 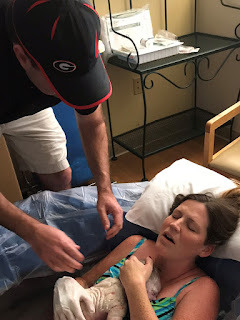 With the end game being a safe delivery, our hope was to start labor with pitocin and then see if my body would continue contracting regularly to allow me to labor and deliver in a birthing tub. 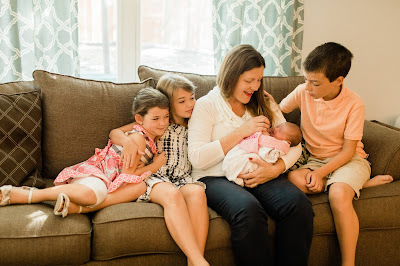 Safety and common sense come first with both medical professional and mom, and I am so thankful that this gifted midwife took care of me and my child. Being the good rule follower I am, I ate one last "my parents are taking us out and I'll never cook again" meal, and headed for home. I diligently worked through the laundry stack before turning my attention to birth prep. When labor started on its own with my older daughters, I furiously hung pictures in the nursery and dusted every surface in the house. This time, folded laundry was the nesting impulse I obeyed. I checked in the hospital at 4 and got back to my room about 6:30 a.m. as it turned out to be a busy morning for births. I began the pitocin drip and employed the usual labor gambits: walk the corridor, sit on the bouncy ball, and my technique of choice: hug the headboard. Since induction artificially begins contractions, instead of starting out 15 minutes apart and gradually coming closer, the contractions come much more quickly and intensely. This is wear the rubber meets the road in labor and where pain relief is needed. As I hoped to deliver in the water, I needed a way to focus my mind to get through these intervals, so I quickly scanned my brain for a mantra. As a child, I would recite hymns as I fell asleep to combat fear. Without analyzing it at the time, I remembered the verse about God delivering his children "with a mighty hand and an outstretched arm." These two phrases carried me through the next phase of labor. I also asked Alex to turn on Christy Nockels' album Be Held: Lullabies for the the Beloved which encouraged me greatly. One song in particular on the album speaks to me as a mother entitled "Always Remember to Never Forget". I've never cried when my children have entered the world; I'm just so profoundly relieved and spent. But this song and its message got me. After a few hours of serious contractions, Holly asked me if I felt ready to get into the water. I felt that I was and after one last tour of the hallways for grins, I was able to de-tether from the drip and get into the birth pool. My midwife worked so hard to give me the birth experience I desired while problem-solving as the inflatable tub had punctured in the last delivery and the replacement had not arrived. The top ring of the pool did not inflate and she was worried about the pool not being deep enough to fill, but she soldiered on and made it happen. I think my complete obedience to any and all requests made by the medical staff and going quiet in labor ("entering my mind palace" as I joked to Alex later) worked in my favor. At this point, I noticed something special. There were four medical professionals in the room: two L & D nurses, my midwife, and a resident on her ObGyn rotation. All four sat around me as Holly coached (told) Alex to sit by my head and hold my hand. Immediately as I sunk into the water, I relaxed with the warmth. Nothing is a magic bullet in labor, but it was a welcome relief. Several minutes passed quietly as the women all encouraged me. I clutched Alex's arm within an inch of my life and Julia began her descent. Holly instructed me to move my hand close to the birth canal (sorry, not sorry) to feel her head. This is the most frightening and intimate moment of labor. I was crying out in pain, face contorted. I was instructed to push and did so. At this point, I knew that moving to my knees to deliver would be optimal, but I was so tired from my movie and pump marathon, that I stayed in a reclined position (and got quite a sore back later). I pushed again as the nurses audibly cheered me on and Julia's head emerged. Holly guided her body out and with a "Julia, be born!" from me (I can be bossy, too) out she came. These moments, that first moment of being safely delivered, are what I've learned are called "thin places," a place where the veil between heaven and earth feel a bit thinner, and God's goodness and mercy are tangible. The gift of being alive, and receiving a new life, are stark and palpable. This is why humankind keeps moving forward. These thin places. I was able to spend several minutes in the water admiring my new baby, catching my breath and just flat out relieved. I've joked that I would've loved an alien if it came out of my body, just as long as it did indeed come out. Next comes that intimate medical stuff that I'll bypass, but where my sweet, nurturing midwife (who massaged my feet with scented lotion in labor-- seriously) was in total boss mode. The cord was cut, baby began nursing, Mom got some clothes back on like a respectable citizen, and the rest of the family could be invited in to meet Julia. Big brother and sisters wore their prescribed shirts and I gave the girls necklaces for our new sorority of four. Five weeks of life have passed in a blur as they always do. Julia is sleeping in her bouncer next to me, pitifully lovely with a full blown case of baby acne. This time will pass before I want it to like it always does. Too soon, I will do or say something to my new child that I'll regret wounds her. There will be problems bigger than baby acne or spit up. But if I've learned anything, I'll keep watching for the thin places. Welcome to the world, beautiful one. Welcome, Julia. Commenting here rather than FB, because who doesn't love old school blog comments? This was lovely, so rich and maybe a touch of magic near the end ("pitifully lovely" caught me - isn't that it exactly?). Your voice has gained something with her, with this. 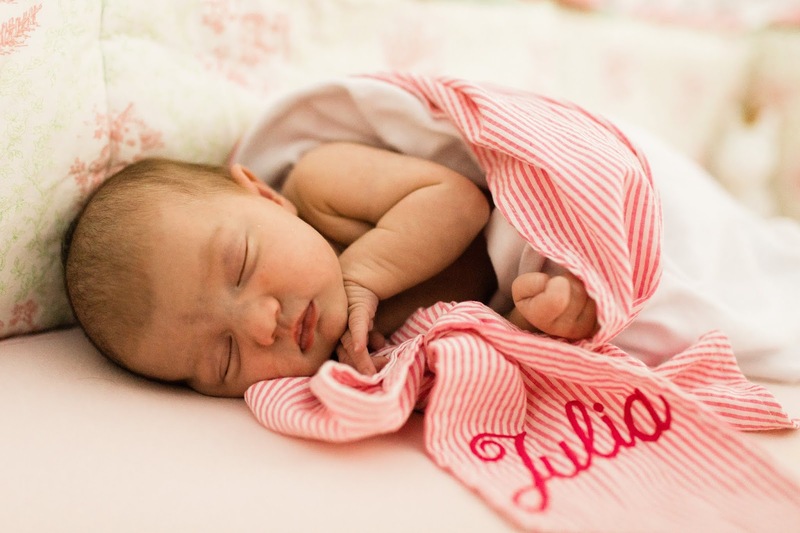 I'm so glad you shared and that Julia Rose is here. I replied in the wrong spot below, but thank you for the reply and encouragement!